The Organization of American States (OAS) held hearings on Tuesday (8) in Santo Domingo, in the Dominican Republic, and questioned the Brazilian State about the federal military intervention in Rio de Janeiro and the execution of councilwoman Marielle Franco and her driver, Anderson Gomes. Twenty social organizations filed petitions with the OAS Inter-American Commission on Human Rights (IACHR) to hold the hearings. One of them included a statement by Franco’s widower, Mônica Benício. After questioning the reasons for the federal intervention in Rio and the lack of transparency regarding the military operations, Brazilian civil society representatives denounced human rights violations that have been committed during the military intervention and claimed the measure by Michel Temer’s administration is not constitutional. Members of the IACHR echoed the accusations made by the petitioners, while a delegation led by the head of the Human Rights Division of the Brazil’s Ministry of Foreign Affairs, Fernando Sena, claimed that the intervention is legitimate, approved by the country’s Congress, and conducted with the cooperation of Rio’s state government. Sena also pointed out that the main goal is to protect the people of Rio de Janeiro and reformulate its public security system amid the state’s financial crisis. In the following hearing, the petitioners presented reports on attacks against human rights activists in Brazil. The coordinator of the human rights organization Justiça Global, Sandra Carvalho, pointed out that 70 activists were murdered last year. Marielle Franco’s widower, Mônica Benício, said that the councilwoman was a victim of the genocide she constantly denounced, and that her death cannot be used to justify the false narrative of the country’s security policies. 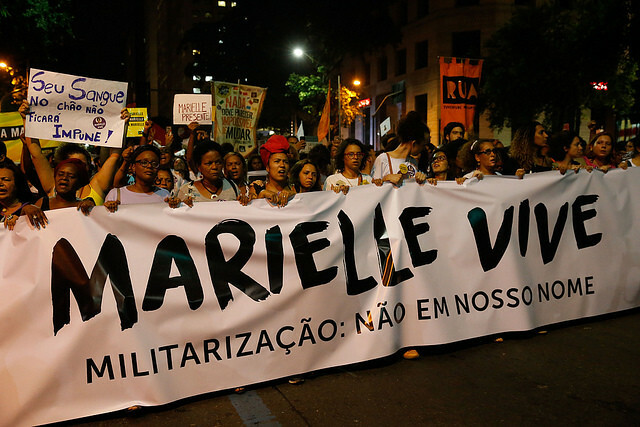 “We are here to say once again that Marielle’s execution will not be used to aggravate the brutal policies that ultimately killed her. We will not tolerate another day of this false narrative of war on drugs and armed conflict that is actually hiding the deep commitment of State officials to perpetuating a lucrative drug and arms trafficking business. This sham will not go on in Marielle’s name,” she argued. Government officials acknowledged that the country fails to duly protect human rights advocates, claiming the State is supporting the investigation into the execution of Franco and Gomes, killed nearly two months ago. In addition to human rights organizations Justiça Global and Conectas, other petitioners included the Brazilian LGBTI Association (Associação Brasileira de Lésbicas, Gays, Bissexuais, Travestis, Transexuais e Intersexos – ABGLT), Terra de Direitos, Redes da Maré, and the Office of the Public Defender of Rio de Janeiro, while Brazilian government officials who participated in the hearings included representatives of the Ministry of Foreign Affairs, of the Ministry of Human Rights, the Office of General Counsel, the National Youth Department, and the Federal Prosecution Service in Rio de Janeiro.